Two new studies have shown that sunlight transforms oil spills on the ocean surface more significantly and quickly than previously thought. The phenomenon considerably limits the effectiveness of chemical dispersants, which are designed to break up floating oil and reduce the amount of oil that reaches coastlines. A research team led by Woods Hole Oceanographic Institution (WHOI) found that sunlight chemically alters crude oil floating on the sea surface within hours or days. In a follow-up study the team reported that sunlight changes oil into different compounds that dispersants cannot easily break up. The results of these two studies could affect how responders decide when, where, and how to use dispersants. The related studies were published on February 20, 2018 in the Journal Environmental Science & Technology and today (April 25, 2018) in the journal Environmental Science & Technology Letters. "It has been thought that sunlight has a negligible impact on the effectiveness of dispersants," said Collin Ward, a scientist at WHOI and lead author of both studies. "Our findings show that sunlight is a primary factor controlling how well dispersants perform. And because photochemical changes happen fast, they limit the window of opportunity to apply dispersants effectively." Dispersants contain detergents, not unlike those people use to wash dishes, which help break oil into small droplets that can become diluted in the ocean, and/or are eaten by microbes before the oil can be swept to sensitive coastlines. But to do their work, the detergents (also known as surfactants) first need to mix with both the oil and water–and oil and water, famously, don't mix. To overcome this barrier, dispersants contain an organic solvent that helps the oil, detergents, and water to mix. Only until this key step occurs can the surfactants do their work to break oil into droplets. But sunlight obstructs this key step, the new studies show. Before dispersants can even be applied, light energy from the sun is already breaking chemical bonds in oil compounds–splitting off atoms or chemical chains and creating openings for oxygen to attach. This photo-oxidation process (also known as photochemical "weathering") is similar to the process that causes paint on your car or colors on your clothes to fade if they are left out in the sun for too long. To date, tests to determine dispersants' effectiveness used only "fresh" oil that hadn't been altered by sunlight. In their studies, the researchers conducted extensive lab tests exposing oil to sunlight. They showed that sunlight rapidly transforms oil into residues that are only partially soluble in the dispersant's solvent. That limits the ability of detergents to mix with the photo-oxidized oil and break the oil into droplets. The finding suggests that responders should factor in sunlight in determining the "window of opportunity" to use dispersants effectively. It would be far shorter than previously thought on sunny days than it would on cloudy days. 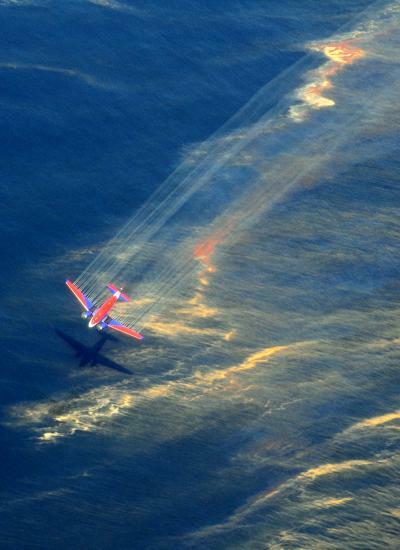 "This study challenges the paradigm that photochemical weathering has a negligible impact on the effectiveness of aerial dispersants applied in response to oil spills," Ward said. "Sunlight rapidly alters oil into chemical compounds that dispersants can't easily break up into droplets. So photochemical weathering is a critical factor that should be considered to optimize decisions on when to use dispersants." In laboratory experiments in the 1970s, scientists had shown that light alters the chemistry of oil, but the findings could not be applied to large-scale oil spills in the ocean. This was largely because in most spills, the oil quickly flowed away from the scene before it could be sampled immediately–in the critical short timespan before sunlight photo-oxidized it. The continuous flow from the 2010 Deepwater Horizon disaster provided a unique opportunity: Because oil floated on the sea surface for 102 days, it gave officials a chance to collect oil shortly after it surfaced and was exposed to sunlight. The WHOI scientists obtained and tested samples of Deepwater Horizon oil that was skimmed from the surface almost immediately after it surfaced. They found that the longer the oil floated on the sunlit sea surface, the more the oil was photo-oxidized. They estimated that half of the spilled oil had been altered within days. The next step was to test how the photo-oxidized oil would respond to dispersants. The scientists tested fresh unaltered Deepwater Horizon oil that was collected directly from the broken riser pipe on the seafloor. They meticulously controlled laboratory conditions to prevent temperature changes, evaporation, light infiltration, and other factors, and they exposed the oil to increasing durations of light. Cassia Armstrong, a guest student from Trinity College, played a key role in conducting these tests and is an author of the paper. The WHOI scientists also closely collaborated with Robyn Conmy, one of the U.S. Environmental Protection Agency's leading experts on developing new technologies for responding to oil spills. To conduct tests on the effectiveness of dispersants, the EPA uses a specific method and custom-designed glassware, which Conmy loaned to the WHOI scientists for their experiments. Results of the experiments showed that light rapidly photo-oxidized the fresh oil, changing it into compounds that reduced the effectiveness of dispersants by at least 30 percent in a few days. Next the scientists teamed with Deborah French McCay, an internationally recognized oil spill modeler at RPS ASA, a science and technology consulting firm in Rhode Island. They simulated conditions that might have occurred during the Deepwater Horizon spill, including a range of winds speeds and sunlight levels. Then they superimposed all the 412 actual flight lines of planes that sprayed dispersants during the crisis. The results showed that under average wind and sunlight conditions, the majority of dispersant applications would not have achieved minimum effectiveness levels (designated by the EPA) because they targeted photochemically weathered oil. Even under the best-case scenarios for aerial dispersant spraying–cloudy weather (which would limit photochemical weathering) and high-wind conditions (which would transport oil farther from the spill area before sunlight transformed it)–dozens of aerial dispersant applications still would not have achieved EPA-designated effectiveness levels. "We assembled a team that combined the expertise of academia, government, and industry," explained Christopher Reddy, marine chemist at WHOI. "In future oil spill crises, the community needs the same kind of cooperation and collaboration to efficiently make the wisest decisions on how to respond most effectively." "This study shows how important it is to do the most basic research on chemical reactions that take place in the environment," said Henrietta Edmonds, a program director in the National Science Foundation's Division of Ocean Sciences, which funded the research. "The results help us learn how to effectively respond to oil spills." The research was funded by the National Science Foundation, the Gulf of Mexico Research Initiative, and the DEEP-C (Deep Sea to Coast Connectivity in the Eastern Gulf of Mexico) consortium.